... The Department of Agriculture’s formal guidance for noncitizens, codified in a June 2011 document, says that there are no immigration consequences for legal immigrants who participate in SNAP. A spokesman for the department confirmed that this is still its official position. So how valid is Dewey's claim of widespread fears, or even any fears, in the legal immigrant community (since — cough, cough — "Undocumented immigrants are never eligible for food stamps, though they may live in a 'mixed eligibility' household that does receive them")? "The SNAP Outreach Coordinator for the Chattanooga Food Bank." "A policy analyst at the National Immigration Law Center," who importantly noted that the fears cited "are unfounded." "The executive director of a suburban Maryland community center that works extensively with the undocumented population," who "asked that her name and organization be withheld out of concerns that ICE might target it." A Hunger Free America manager who says he "recently helped two legal resident families in Corona, Queens, remove themselves from SNAP." "A SNAP outreach coordinator at the Food Bank who works with the Latino community" in Maryland. "A health policy analyst at the National Council of La Raza." Despite contacting and getting quotes from all of these people, Dewey was nevertheless "unable to speak directly with immigrants who chose to cancel their SNAP benefits." Really? That's a little hard to handle. Good heavens, did she even try? Or if she did try, did this legion of social assistance officials and immigrant activists refuse to connect her with anyone? If they blocked her, was it because they wanted to protect their clients' privacy? (Surely the reporter would have used assumed names for those she interviewed if she felt it necessary.) Or was she blocked because their stories of grief are partially, mostly or entirely fictional, or are in some cases being told by people who are here illegally and have still managed to obtain benefits? Unless and until Dewey speaks to someone directly affected, her evidence isn't "anecdotal." It's "second-hand anecdotal," and barely more than a set of rumors. One also can't ignore the fact that Dewey's "evidence" comes from people, no matter how well-intentioned, who arguably have a vested interest in exaggerating the problem and demonizing President Trump and his administration. 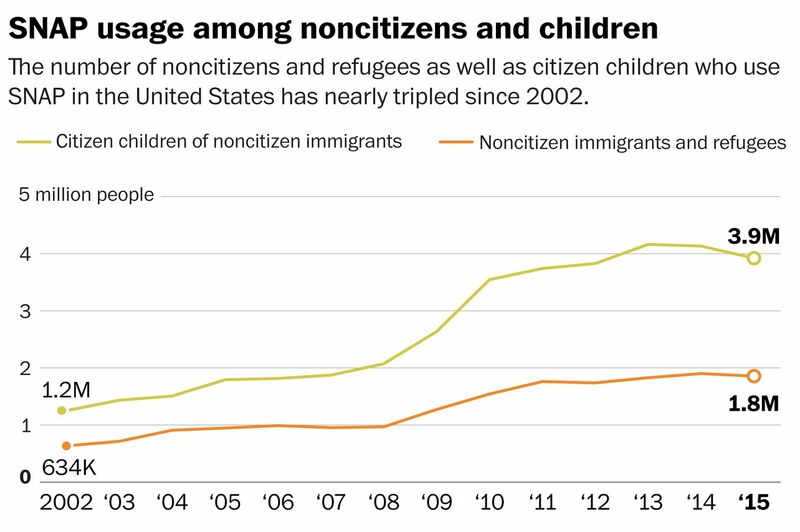 It's clear from the chart that once Barack Obama became President, and especially during his first three years in office, food stamp enrollment of noncitizen immigrants and refugees and children of noncitizen immigrants, which had been modestly increasing for some time, skyrocketed. Why didn't Dewey investigate and explain why this happened? How much of these sharp enrollment increases were due to increases in those populations? How much was due to the recession (but if this was a big reason, why have the numbers barely come down from their peak?). How much of the increase had to do with reduced resistance to what once used to be a stigma associated with benefiting from a government giveaway program? How much had to do with weaker screening which may have allowed more people who were not genuinely eligible onto the food stamp rolls? All of this is certainly relevant to the current matter of people in theses groups dropping out of the program. Maybe many of the more recent recipients never were genuinely eligible, or have since become ineligible while continuing to receive benefits, and are dropping out now before they get caught. The MSM and liberals have been crying about the end of the world now for some time. Their alarmist hyperbole is having a negative impact on children who may have a legitimate right to assistance.